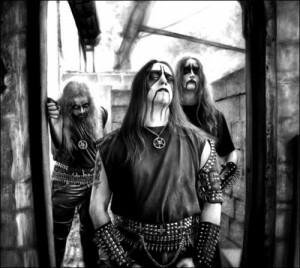 By the time the sixth album of Belgian black metal outfit Enthroned was released upon the world, the band had regained a comfortable level of internal stability. With a dedicated label partner, the band wrote another strong album that was worthy of their collective and entirely second-tier legacy. 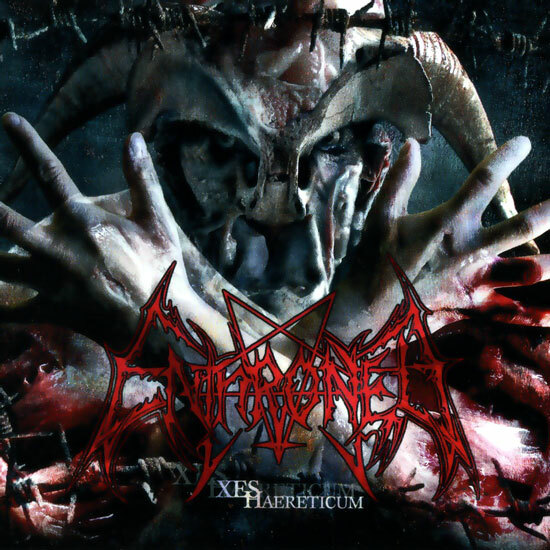 “XES Haereticum” is the last album to feature long-time vocalist/bass guitarist Franck Lorent (Sabathan), and the last in their traditional black metal style. After this album Lorent would bid his farewell to the band, leaving no original members within the band in his wake. Régis Lant (Nornagest) would step up to the microphone and thus become its new spokesperson. Lant had been the creative backbone for a few records prior to this album, and he would eventually transform Enthroned into the theological entity it is known as today. Despite the Greek-Latin album title there aren’t any great innovations to be found on this record. Enthroned was well aware of what worked and what didn’t. The album is a middleground between the band’s thrash leanings of the abysmal “Armoured Bestial Hell” and the Norsecore of anything else from the Sabathan-era. It is the band’s most ravishingly intense platter since “The Apocalypse Manifesto” and “Towards the Skullthrone Of Satan”. Notable is that the already hinted-on traces of Lant’s writing come into full bloom here. The choirs, clean vocals, ritualistic rhythms, atmospheric effects and a stronger reliance on traditional metal leads/solos all would come to characterize the albums to follow. Notable is that two tracks (‘Nightstalker’ and ‘Crucified Towards Hell’) feature creative input from former guitarist Vincent Gerard (Tseboath). This is the band’s most ambitious album on a number of levels. Musically, this is a surprisingly effective merging of the thrashing and oddly technical bits from “Armoured Bestial Hell”, the atmosphere of the band’s earliest records, and the Norsecore that we have come to expect of this unit. The lyrics are a mix between the goofy, comical Satanism and overcooked infernal imagery of the Lorent written works, and the abstract philosophical – and theological musings of Lant. A lot of times the tempo is notably slower in comparison to past works, but when the band does blast the tempo goes into suffocatingly high tempos. ‘Vortex Of Confusion’ and ‘Seven Plagues, Seven Wraths’ are the signature tracks, and the template from which all future material would be culled. Lant had a hand in every single track on this record, except in the Gerard penned ‘Crucified Towards Hell’, and his influence is rife through out the recording. In truth, this is the first Lant-fronted Enthroned album. Circumstances forbade him from usurping his future and coveted frontman position, with Lorent manning the microphone still. That is not to say that “XES Haereticum” isn’t without its quirks, flaws, or peculiarities. ‘Hellgium Messiah’, the last track on the standard version, is a self-aggrandizing and self-empowering hymn that borders on Manowar levels of indulgence and egocentrism. It is somewhat redeemed by ending with a sampling of the Belgian national anthem, the Brabançonne. ‘Crucified Towards Hell’ is penned by former guitarist Vincent Gerard, and very much sounds like his material on “Prophecies Of Pagan Fire”, but is more compact, meaner and tighter on all fronts. ‘Satanic Metal Kult’ is partly a self-praising hymn like ‘Hellgium Messiah’, and partly a non-ironic self-aware cut in terms of lyrics. Overall, ‘Satanic Metal Kult’ feels more like a proof-of-concept for a better song – why was this included exactly? ‘Under the Guillotine’ is a Kreator cover, probably included on behest of Franck Lorent’s appreciation of the genre, and its ancient Teutonic masters. Retaining the production formula of the previous record, Harris Johns and Spidersound Studios were once again tasked with committing this material to tape. As such there isn’t much of difference in terms of production, although “XES Haereticum” sounds a lot more organic and punchy compared to the somewhat sharp and digital sounding “Carnage In Worlds Beyond”. Above all else, “XES Haereticum” is the crunchiest, analog sounding record of the Sabathan-era, and not since the debut has Lorent’s bass guitar sounded this good. The artwork, design and lay-out has never been better – and despite the overall goofiness of the whole, it is clear some considerable thought was put into the presentation of this product. The photography is beautifully done, and the booklet is amazing to leaf through. The spelling – and grammatical errors are kept to a minimum, which somewhat redeems the band’s continual butchery of Shakespeare’s language. The final album with Franck Lorent is the best Enthroned record currently available. It is intense, diverse, and more importantly, it is musically and thematically ambitious. With the improved lyrical matter, the traditional thrash metal influence more prominent and the band’s obvious higher level of skill makes it a worthy farewell for the band’s only link to the past, its frontman and bass guitarist Lorent. This would be the last album to feature Yann Herrera as a full-blown member, as he would only sit in as a studio musician on the first Nornagest-fronted album “Tetra Karcist”. Régis Lant would transform the outfit on every conceivable level with the subsequent record, Lorent would go to star in a low-budget adult movie before returning to the deeper regions of the underground with a number of local low-profile thrash – and death metal bands. For their fifth album the Belgian “blackened horde” of Enthroned knew that all bets were off. After the debacle that was “Armoured Bestial Hell” the band needed to come back with a bang – and a number of facts played in their advantage. They had signed a new recording contract with Austrian label Napalm Records, they had enrolled a new drummer in Yann Herrera (Alsvid, from French act Seth) and were set to record at Spidersound Studio in Berlin with famed metal producer Harris Johns (Helloween, Immolation, Kreator, Sodom, Tankard). This was the band’s most important album since their debut, and with a stable label partner and a new skinsman Enthroned were poised to finally take their place in the black metal underground. Did they? Yes, in fact. This is the most potent album they have put on the market since “The Apocalypse Manifesto”. In many ways this is a return-to-form for a band that has always been a second-tier at best. Clearly the addition of Herrera on drums lit a fire under the band as this is their most violent, their most concise and most focused effort since “The Apocalypse Manifesto” and “Towards the Skullthrone Of Satan”. Many things that fell to the wayside on the previous mockery have been duly corrected. All songs are blisteringly fast, blast-oriented cuts with the band’s patented melodies, the worthwhile leads/solos and Lorent’s thundering bass guitar. Lorent’s vocals are as comical and intense as ever, but his performance is far more spirited and violent here. It feels like he is screeching his lungs out. One wonders how he is able to speak after such a hellish performance. The writing style recalls the stronger aspects of the band’s earlier works, namely the unanimously savage “Towards the Skullthrone Of Satan” while the eerie melodies of “The Apocalypse Manifesto” feature more prominently again, which is a plus. Herrera’s drumming is precise, war-like and varied, which is everything this band could ever hope for. In his first of three recording ventures with this band, Yann Herrera is simply the best Enthroned drummer since the studio session drumming of Da Cardoen half a decade prior. Ever so slightly Enthroned’s thrash metal past resurfaces here, but it would not fully come to blossom until the next album. Overall this album takes a hint of Enthroned’s past and runs with it to its logical, modern day conclusion. It’s savage, utterly relentless and an endurance test for all involved, but after the unanimous debacle that was “Armoured Bestial Hell” the only way was up. The band understood its predicament and sought to right itself and return to its past, second-tier glory. Hinted already on the unmitigated disaster that was their last album, Enthroned here experiments with atmospheric tracks sparingly. ‘Land Of Demonic Fears’ is the most atmospheric thing the band has done since ‘Hertogenwald’ and ‘Evil Church’ on “Towards the Skullthrone Of Satan”. The odd chord progressions, technical riffing and overall more complex song structures of the maligned “Armoured Bestial Hell” make a return, but the songs are better structured and clearly written to the band’s strengths. ‘Diabolic Force’ is a re-recording of an old Morbid Death song, but fits well with the band’s improved and revised sound. Even the addition of choirs doesn’t hurt the picture. For a band as notably conservative and traditional as this, it is a welcome surprise. Not only does the band sound more sophisticated – finally we are getting what they have always promised. It took them five albums, but it is here. Enthroned is at long last living up to whatever little potential they possessed when they formed many years ago. While this is merely a proof-of-concept for the next and much better album “Carnage In Worlds Beyond” is beyond the obvious more ambitious and musical than anything. The band want to prove something to the listener and they succeed with flying colors. The biggest improvement however is the production work of thrash guru Harris Johns. 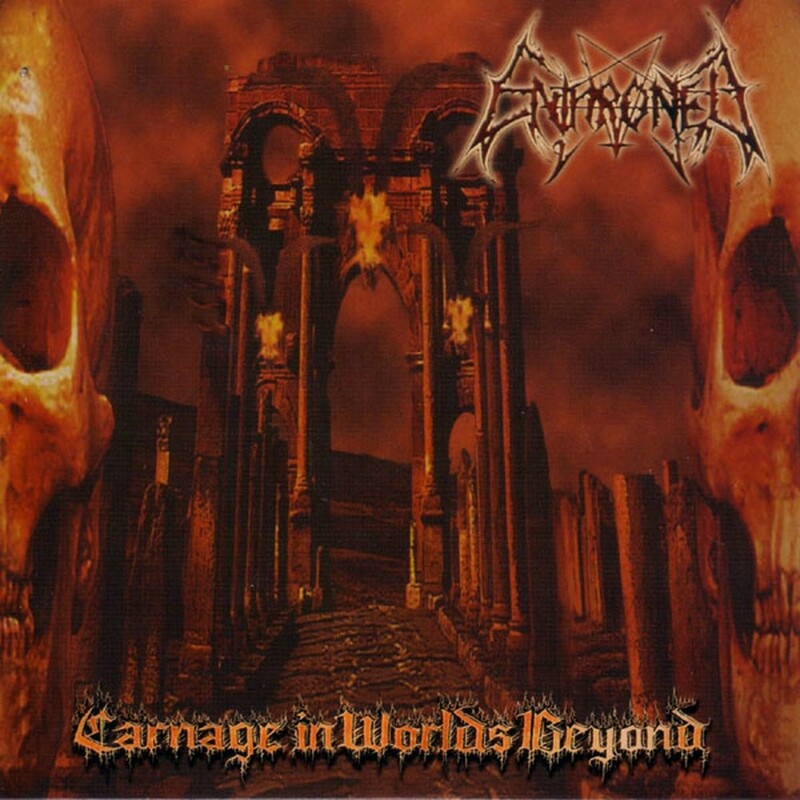 At once both earthly and organic but also digital and crisp “Carnage In Worlds Beyond” is the best sounding Enthroned record in years. The better song material benefits immensely from this treatment. It is fairly easy to overlook how generic and trite this band actually sounds thanks to the wonderful job behind the console by Johns. Next to the production the whole album exudes professionalism and seriousness. The artwork, design and lay-out are superb, the photography is extremely well done and the record just looks like an actual real product. Slick, glossy and ready to be grabbed off the shelves. Maybe it was the benevolent influence of new contractor Napalm Records?